Civil service salaries will be cut by five per cent in 2010 and frozen in 2011 as part of the measures which aim to save $19bn. "We need to make a singular, exceptional and extraordinary effort to cut our public deficit and we must do so now that the economy is beginning to recover," Zapatero told parliament. The measures come days after a $1 trillion fund was established to prop up weaker eurozone states and just hours after Barack Obama, the US president, pressed Zapatero to be "resolute" in efforts to implement economic reforms. The cuts were badly received by unions which, while so far maintaining good relations with the Socialist government, have already put the brakes on a government move to raise the retirement age to 67 from 65. "The proposed cuts merit outright rejection," said Ignacio Fernandez Toxo, leader of Comisiones Obreras, Spain's biggest union confederation. Toxo said that he would not rule out any action to protest against the measures. But the leader of the second-largest labour grouping, Candido Mendez of the Union General de Trabajadores, sounded a more conciliatory note, saying that he still thought it possible unions might agree to labour market reforms. 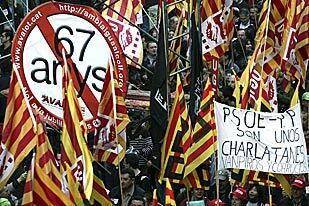 Unions only represent about 16 per cent of Spanish workers and marches earlier this year against earlier austerity measures were tiny in comparison with the mass fury unleashed by their Greek equivalents. But Zapatero's latest measures for the first time directly target public sector workers, the unions' main constituency, which could put labour leaders under pressure to take more aggressive action. The latest cuts, which follow an earlier $63.5bn in austerity measures which had failed to convince markets, also include a reduction of more than $7.6bn in public investment. They are intended to reduce the budget deficit to 9.3 per cent of gross domestic product this year, from 11.2 per cent in 2009, six per cent in 2011 and the three per cent limit stipulated by European rules by 2013. "These measures go in the right direction," said Ollie Rehn, the European economic and monetary affairs commissioner. But Mariano Rajoy, the leader of the conservative Popular Party opposition, accused Zapatero of allowing government finances to deteriorate to the point that Spain had to be pushed to act by the European Union. Rajoy said Zapatero had reduced the country to a "protectorate" of Brussels.